With over 20 years in the construction business, the Perterich Construction & Roofing team has the skill set to handle any project. Our background in previously working with a national roofing company taught us the most efficient way to handle insurance claims. We also built large, national brands. But, we also learned where national firms fail. They don’t care about their customers. They are looking for the most efficient means to construct and roof and move on as quickly as possible. That’s not how we do it at Peterich Construction & Roofing. The Peterich brothers started the company in 2012 with one simple goal, always put the customer first. Developing a relationship with the customer and showing them options is our priority. Being a truly family owned and operated company insures you have one of the founders servicing your needs. What drives us is simple. We take pride in our workmanship. Dan has over 20 years of experience in the roofing and construction industry. His time has been well spent. Not only learning the skills of a true craftsman, but also learning first hand the best techniques, lessons and putting in the hard work it takes to become successful. Dan is an insurance expert and has dealt with hundreds of claims. He utilizes this background to help you in the occasional insurance battles. 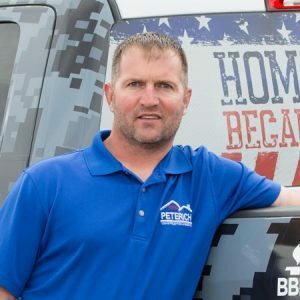 Dan served his country in the Marine Corp for 5 years and is the reason our logo includes semper Fi (Semper Fidelis). This Latin word translates to “always faithful.” When starting the company Dan wanted to let his customers know of his commitment to keeping his word and seeing the project through. Dustin has over a decade of experience in the construction and roofing industry. He was also an insurance claim specialist and uses that background to support our customers. 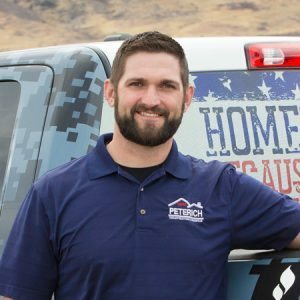 His time with a large national restoration company taught him the complexity of what it takes to restore a home while working with an insurance carrier. The experience was invaluable and our business thrives based on his learnings. 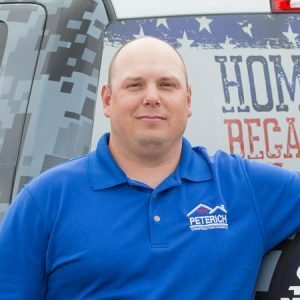 With over 15 years in the construction and window industry, David is our resident expert and your go-to guy. With over 1000+ window installations for homes and automobiles his experience serves our customers very well. He is an extremely skilled carpenter and that is evident on every project he touches. David’s time in the industry has led him to become an expert in the insurance claims process. David has been part of the Peterich family for over 20 years married to Joelle Peterich and have a son, Angelo.